- What's a prime number? - What's a a prime factor? - How to find prime factors? Every number is divisible by 1 and itself, so it's about as interesting as saying that Mona has birthday once a year and eyes, ears and nose. A prime number exactly has 2 factors: 1 and itself. The number 1 is not a prime number, since its only factor is 1. Life is much easier if you memorize at least the first prime numbers. This important exercise teaches you to recognize whether a given number is a prime number ist. If you have any problems with this exercise, please have a look at the hint and the sample solution first. If all factors are prime numbers then they are called prime factors. Any number that is not a prime number can be disassembled into its prime factors. 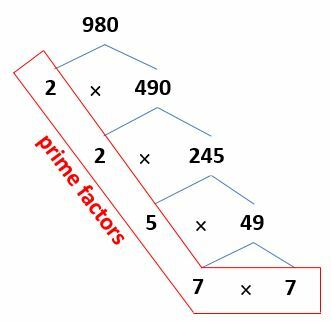 Multiplying these prime factors results in the number. Prime Numbers: "The building blocks of all positive whole numbers"
Let's continue with: "Greatest Common Divisor (GCD)"